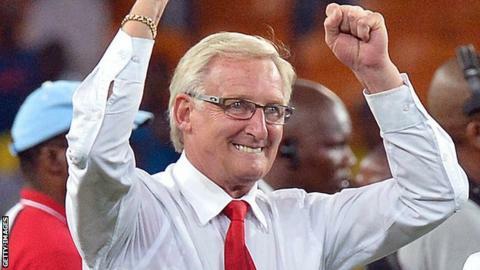 South Africa coach Gordon Igesund has been cleared of allegations he incited Bafana Bafana players to strike for more money ahead of CHAN 2014. At a news conference in Johannesburg on Thursday, the South Africa Football Association said it had found no basis for any of the allegations. The 57-year-old, who has been in charge of South Africa since 2012, had always strongly denied the claims. He is now free to see out his contract, which is due to end in June. It means he will oversee the team on their two-match tour down under next month, but it will almost certainly be the last assignment for the coach after failure at the Africa Cup of Nations and this year's CHAN tournament. South Africa are expected to appoint a new coach in June to allow time to prepare for the start of the 2015 Nations Cup qualifiers in September. The Arendse Commission, who carried out the inquiry, was headed by Cape Town lawyer Norman Arendse, a former president of Cricket South Africa who is also a provincial football association president. Arendse had told reporters on Wednesday that several witness called had refused to provide testimony. "And we do not have the power to force them," he said. But Arendse and five other members heard evidence from others, including from Igesund.